The ill-fated future of Jaffna was first identified by Mylvaganam Pulavar who wrote the first official history of Jaffna, Yalpana Vaipava Malai, at the request of the Dutch governor in 1736. The forecast of Jaffna’s doomed future is pronounced by Suppathidda muni who told King Pararajasegaram that “sovereignty will never again come back to your descendants.” However, this prediction in Mylvaganam’s history is less important — perhaps, even irrelevant in rational historiography — than his focus on the cruelty (he calls it the “insane fury”) that bloodied the pre-Dutch period, from Sangkili to the Portuguese. One strand of the dark forces that haunted Jaffna throughout its history is the unrestrained “insane fury” of the pre-colonial period (starting from Sangkili) that flowed right down, going through the phase of the Vellahlas, to Prabhakaran. The average Jaffna man, living under the oppressive regimes of each phase, was a victim of the “insane fury” that dehumanized him, making Jaffna a brutal enclave with no parallel in any other part of Sri Lanka. In all three phases of the history of Jaffna — pre-colonial, colonial and post-colonial periods — the average Jaffna man was locked inside a socio-political framework that denied him the space to breathe the air freely or walk the length and breadth of the peninsular with a sense of dignity. Jaffna was a rigidly structured socio-political order with the most privileged power elite of the nation sitting comfortably at the top while having no qualms in crushing their slaves and low-castes under their jackboots. The pain and the suffering inflicted on the Jaffna man by his leaders — most of whom claim to be “liberators” — amount to violations of the fundamental rights of the Jaffna man to be human. The rigidly stratified society seemed to have reduced Jaffna into a straight jacket and the desperate Jaffnaites seemed to have had no way out of it. Social scientists noted that the highest suicide rate in Sri Lanka was inside the north and the east. Jonathan Spencer, anthropologist from Edinburgh University highlighted that “the lowest (suicide) rates are found in Colombo and the densely populated southwest littoral” and “(T)he most spectacular (suicide) rates are found in Tamil-dominated areas…” He also adds that “there may be distinctive social and cultural factors which account for a higher long-term predilection for suicide in Sri Lanka Tamil society..”. ( p.8. Collective Violence and Everyday Practice in Sri Lanka, Jonathan Spencer, Studies in Society and Culture, Sri Lanka Past and Present, edited by Michael Roberts, 1993). Isn’t suicide the easy way out of a society that prevents citizens from being human? This suicidal tendency took away the heroism in the suicide cult put together by Prabhakaran. It was there, ready made, in the socio-political culture of Jaffna for Prabhakaran to exploit without much efforts on his part. Jaffna is also a society living in denial. This state denial is a defence mechanism needed to keep their sanity in times of peace and, more importantly, in times of violence when they run amok with their “insane fury.” They are adepts in hiding their brutal society under the carpet and parading in world fora as dedicated champions of human rights. They never had the nerve at any time to correct the systemic oppression that condemned their people to subhuman misery. The lower rungs in their hierarchical order were kicked around as pariahs. And if you ask a moral poseur like Prof. Kumar David, a leading left-wing proponent of Tamil tribalism equating it with Marxism, why he did not thunder against the Vellahla oppressors the way he protests against the Sinhala elite he would throw abuse at you and retreat whining, with his tails between his legs, to hide ignominiously under the proverbial carpet. This is typical of the Jaffna Tamils who have a passion to wallow in their myths to make-believe that they are the purest of the pure — so pure that not even a low-caste Tamil could clap their eyes on him in case it pollutes their purity which would force them to take another bath! But to grasp the “insane fury” of peninsular politics that led the Tamil leadership into a dead-end from which it could not get out it is necessary to go back to G.G. Ponnambalam (Snr). The political climate was comparatively benign and calm when Ponnambalam shot into prominence among the Tamils in the ’30s. The British were still the ruling masters of Ceylon, as they called it then. The Sinhala-Buddhists, though they were in a majority, did not have the full powers of the state to impose their will. 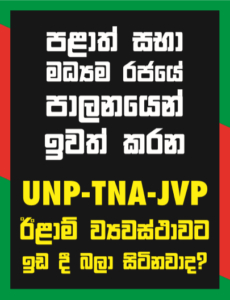 There was no Sinhala-Buddhist Army, Navy, Air Force or Police. For all his cries of “discrimination” against the Tamils by the Sinhalese the Tamils were in a commanding positions of the British administration. The Tamil professionals were on par with the majority having even an edge over the Sinhalese in some fields. Nor was the Sinhala Only Act in force. The inter-ethnic relations were relatively calm except for the Nawalapitiya incident which, of course, was like a dark shadow that casts the coming events. It was also the golden period when the idealistic Jaffna Youth Congress was agitating for national unity, opposing the anti-democratic communal representation and demanding territorial representation as a universal principle. At the grasroot level the Tamil and Tamil-speaking Muslim traders, who had infiltrated every nook and corner of the cities and villages of the south, were co-existing in a multi-ethnic, multi-cultural harmony. Considering the political conditions of the ’30s, considering the halcyon days under the British raj, considering the readiness and the willingness of the Sinhala majority to concede a disproportionate and undue share of power, far exceeding the demographics of the minorities, why did Ponnambalam reject it and what was the necessity for Ponnambalam to go ballistics against the Sinhalese in Nawalapitiya? Perhaps, only the ingrained “insane fury” of the peninsular political culture, mixed with arrogance and intransigence, could account for this irrational behaviour of Ponnambalam. This historical evidence recorded in the Sessional Paper of 1944 (See footnote 13, in Arasaratnam) debunks the concoction of all the political pundits — from Harvard to Colombo University — that the root cause of the north-south conflict is due to “Buddhism Betrayed,” or Dharmapala, or “Sinhala-Buddhist chauvinism,” or the paintings of hell in Buddhist temples (Jayadeva (Marthelis) Uyangoda, the lumpen Marxist theoretician), or the web of myths spun by Kumari Jayawardena to feed her insatiable gluttony for anti-Sinhala-Buddhist hatred. This also explodes the theory of the Tamil propagandists and their hired agents in academia and NGOs who argued that the Tamils could not get anything except through the violence encoded in the Vadukoddai Resolution. The historical record proves unarguably that the Sinhala majority had acted with utmost generosity and consideration to their Tamil neighbours — perhaps, the best the Tamils had ever found in their history. If further proof is necessary, consider the other offers made to the Jaffna Tamils. First, “the Sinhala-Buddhist state” granted, though under Indian pressure, regional autonomy to the merged north and east for the Tamils. What did the Jaffna Tamil leadership do? Prabhakaran killed 1700 IPKF soldiers in the north and sent a hand-picked suicide bomber to S. India to assassinate Rajiv Gandhi, the architect who was bent on giving the Tamils the best through his Indo-Sri Lankan Agreement. Finally, with international guarantees, Prabhakaran was handed on a platter an autonomous state in the north and east, signed by Ranil Wickremesinghe and Erik Solheim, the representative of the international community. Solheim later revealed that India was involved with the Ceasefire Agreement every step of the way, which means that the international community and the regional super power guaranteed it. But Prabhakaran, according to the Scandinavian Peace Monitors, violated 95% of the terms and conditions of the Ceasefire Agreement of February 22, 2002 and finally killed Wickremesinghe politically — never to rise again — by ordering a ban on voting for him in the presidential election of 1995. So who is to be blamed? The historical record underscores without a shadow of doubt one incontrovertible fact: it is not that “the Sinhala state” did not give a substantial — if not unwarranted — measure of autonomy to the Tamils at the expense of the other communities. It is simply that the Tamil leadership rejected them all. In fact, the more you gave them the more they turned and hit back at “the Sinhala state” — the goose that laid the golden eggs for them. If the Tamil leadership accepted any one of the political solution offered by “the Sinhala-Buddhist chauvinists” they would be dancing rings round the majority today. They would have had the “Sinhala state” in a corner from which they could not get out. Any one of the solutions mentioned above would have tied down and imprisoned “the Sinhala state” with constitutional, legal and political constraints forcing it to concede more and more, particularly under increased international and Indian pressures later. In fact, they could have avoided Nandikadal and survived as victors. Prabhakaran would not only be living today but he would also be dictating terms to “the Sinhala state” and the international community with the manipulative pressures of his agents in the Tamil diaspora. On this historical record, the Sinhala-Buddhists can stand on any platform and proclaim proudly that they gave more than what the Tamils of Jaffna could have got from any other majority community and the Tamil leadership rejected them all. Purely on their record, the Sinhala-Buddhists have the right to say: Please don’t blame us for the crass stupidity of your insane Tamil leaders. The Jaffna Tamils were given the best deals that any minority could hope for except separatism which was non-negotiable. Had they some common sense they could have pressured and bargained and even resorted to military action, as stated in the Vadukoddai Resolution, if they had pragmatically accepted, established and consolidated a regional autonomy granted in the various offers made by “the Sinhala state.” Accepting the offers could have established some borders, at least nominally with international and regional guarantees, for them to use as a stepping stone to the next level of Eelam. But the Tamil leadership responded with outright rejections or total violence which saved the Sinhalese. The Sinhalese have to thank Prabhakaran and the Vellahlas who backed him, with offers of flowers, for rejecting all that was offered to him. It was his stupidity that saved the Sinhalese. It is hard to find another minority who got so much from so many and lost everything, gaining nothing, because of Tamil arrogance, intransigence, stupidity and over-ambitious obsession with mono-ethnic extremism. Leaders at every critical moment in their careers are faced with multiple choices and the choice they pick eventually determines their future and that of their people too. The choices they make can either take their people to the depths of despair or to the havens of their aspirations. The choices made by the extremist leaders of Jaffna invariably took them and their people to the nadir of despair. Even when they are offered the opportunities to liberate themselves from their oppressive past they intransigently choose the very path that took them back to their self-destructing past. They are like the ill-fated characters who came out of the pages of Camus’ story, The Guest. It presents a parallel that explains the tragic trek of the Tamils from Vadukoddai to Nandikadal — a path which they took out of their own free will. Daru, the teacher in Algeria, is handed an Arab murderer, with instructions to deliver him to the Police station, in Tinguit. With great reluctance, Daru takes his prisoner down the plateau to a “level height” where the road forks. One goes south to freedom. The other goes east to Tinguit and prison. Instead of taking the prisoner to Tinguit Daru pauses and gives his prisoner 1000 francs and food and sets him free. To make sure that the prisoner takes the right road to freedom Daru “roughly” turned his prisoner in the direction of the south and goes up heading towards his school. On the way up Daru looks back only to find the prisoner walking slowly down the road to Tinguit.